I&apos;m a fan of attending outdoor events and opportunities to buy fresh and local produce, crafts and other items. So, it&apos;s no secret that I enjoy visiting local farmers markets. 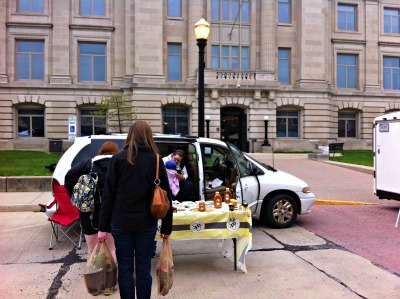 It&apos;s a great time to be outside, buy fresh produce and chat with local vendors. I take photos and get all kinds of inspiration at the farmers market... a new recipe or an idea for the garden. I like to go to the farmers market with family and then go out to lunch or dinner afterward. Did you know that some of the best farmers markets in Indiana are right here in Hendricks County? 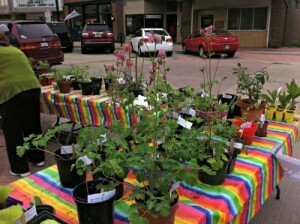 A couple of weeks ago, I attended Danville&apos;s Geranium Festival and the official start of the Danville Farmers Market. It was an unusually cold Saturday morning, but that did not stop me from spending a lovely morning walking around the Courthouse Square in Danville with my dog, Louis. During our morning at the market, we found a number of vendors selling products such as doggie biscuits (Louis loved these, especially the barbecue ones), baked goods, honey, meats (such as lamb), and several garden vendors. It was the Geranium Festival, after all! There was even live entertainment, with a singer and guitar player. I had a blast at the Danville Farmers Market, and I plan to go back soon and visit some of the other Hendricks County Farmers Markets. 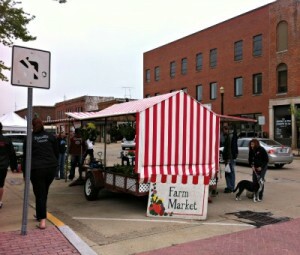 Here&apos;s what you need to know: Danville Farmers Market - 8 a.m.-noon, Saturdays, May through September on the grounds of Danville&apos;s Courthouse Square, 10 S. Jefferson St. *Don&apos;t miss an opportunity to walk around the square and stop at one of downtown Danville&apos;s restaurants for a meal after the market. Visiting one of the Hendricks County farmers markets is a great way to support local businesses and experience some of the best of Hendricks County. The markets are all family-friendly and you can find fresh produce, crafts and other goods. Please note that times for some of the markets, such as Brownsburg, have changed. For the most up-to-date information, be sure to check with the websites and markets for other activities, such as live music and demonstrations. More Hendricks County Farmers Markets Avon Farmers Market – 4 to 7 p.m., Tuesdays beginning June 4 through Sept. 24, in the parking lot of Hendricks Regional Health, 8244 E. U.S. 36 (along U.S. 36, just east of Dan Jones Road). Brownsburg Farmers Market – 4:30 to 7:30 p.m. Thursdays beginning June 6 through Sept. 5 at Brownsburg Town Hall, 61 N. Green St. Pittsboro Farmers Market – 9 to 11 a.m. Saturdays in July and August at Scamahorn Park, 52 E. Main St. Plainfield Farmers Market – 4 to 7 p.m., Wednesdays beginning May 29 through Oct. 2 at Plainfield Friends Meeting, 105 S. East St.